Last Temptation is a small crag that is found on the way to Goat Rock. The cliffs face west and are in full sun most of the day making it a fairly hot place to climb. There are approximately 8 routes here, mostly sport, but some routes do require trad gear. Anchors are found on top of most routes. An easy decent follows a trail down the left side of the cliffs. Other guidebooks do mention snakes but we didn't see any on this trip. From the Castle Rock State Park parking lot, follow the trail that leads down towards the Waterfalls lookout platform. Once you cross the little stream don't follow the trail leading down left to the waterfall but follow the trail that goes up the hill and to the left. After about 5 minutes the trail will lead out of the trees and as soon as you are out in the open, look right and up. The right side of the Last Temptation cliffs will be about 40' above you. A path leads up towards the left side of the cliffs from the patch of trees ahead. 1. Lobotomy, 5.11d. One bolt about 10 feet up, two closely spaced bolts at a big roof about 40 feet up, two-bolt anchor. 3. Charlie's Angel, 5.11b, 5 bolts, two-bolt anchor (shared with Chimps in Negligee). 4. 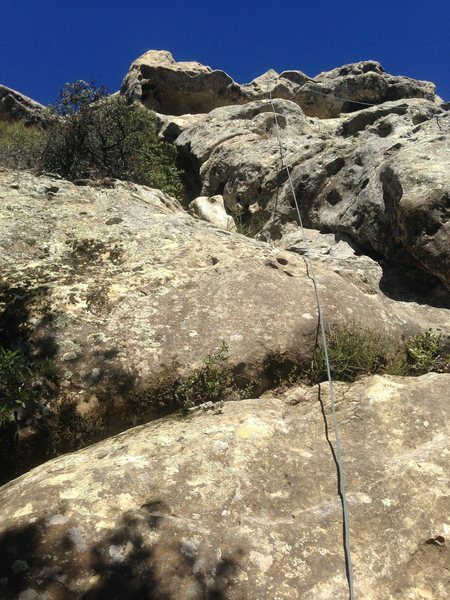 Go I Know Not Whither, 5.10d, 4 bolts, two-bolt anchor (bring cams, finger or hand sized). Had a great time visiting this area last weekend. As we were on the trail to Goat Rock, we ended up checking out the first rock formation we came to and climbed it a bit. There's plenty of bolted anchors on it and a couple sport routes. I can't find any info on it on Mountain project. Anyone know what rock we climbed.